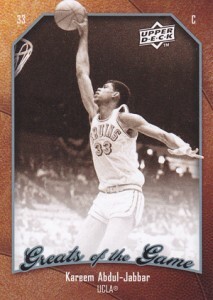 The Kareem Abdul-Jabbar v. Upper Deck trial has a start date of April 12. This comes after Abdul-Jabbar's attorney, John Gaule, blasted the company and its CEO, Richard McWilliam. During a pretrial hearing on Monday, Gaule was unhappy that McWilliam no-showed for a settlement conference that may have led to a deal between the two parties. According to the Los Angeles Wave, a conference between the two parties was scheduled for last Thursday that Abdul-Jabbar attended. McWilliam did not and an Upper Deck executive was there in his place. Gaule was critical that the person Upper Deck sent did not have the proper authority to make a settlement. The attorney also claimed that McWilliam had missed two out of three depositions for the case. Upper Deck's attorney, David Skilling, alleged that Gaule was given advance notice that McWilliam would not be at the settlement conference. He also said the Upper Deck executive sent in his place did have the authority to sign off on a settlement if one was reached. Los Angeles Superior Court Judge Michael Linfield said, "I'm getting increasingly concerned about Mr. McWilliam's lack of serious participation in this process." He also said that he would consider monetary sanctions against Upper Deck but would hold off any decision until April 11, the day before the trial is set to begin. Abdul-Jabbar sued Upper Deck, alleging his image was used without his permission. The Hall of Famer contends he signed an 18-month deal with the card maker in 2008. He claims the deal specified that it was only for images from his professional career. 2009-10 Upper Deck Greats of the Game Basketball pictures Abdul-Jabbar in his UCLA uniform from his college days. This is just the latest issue for the embattled CEO. Last month, McWilliam allegedly showed up drunk to a deposition for the case.